WHAT? ? ?, no hockey this season?. Seriously, Anders I wish you all the best. Tack för uppdateringarna! Det är så skoj att kunna följa bygget och imponerande på alla sätt. Det var så lite så, kul att nån ids följa ett sånt här långtidsprojekt. I did another run today up to 3 bar boost pressure, still problems with falling oil pressure but I think it is the tank foam (oil proof fuel cell foam) that is restricting the oil circulation. I have removed the foam and will do another test run ASAP to confirm the theory. What power level do you expect? >250hp and a shitload of torque. 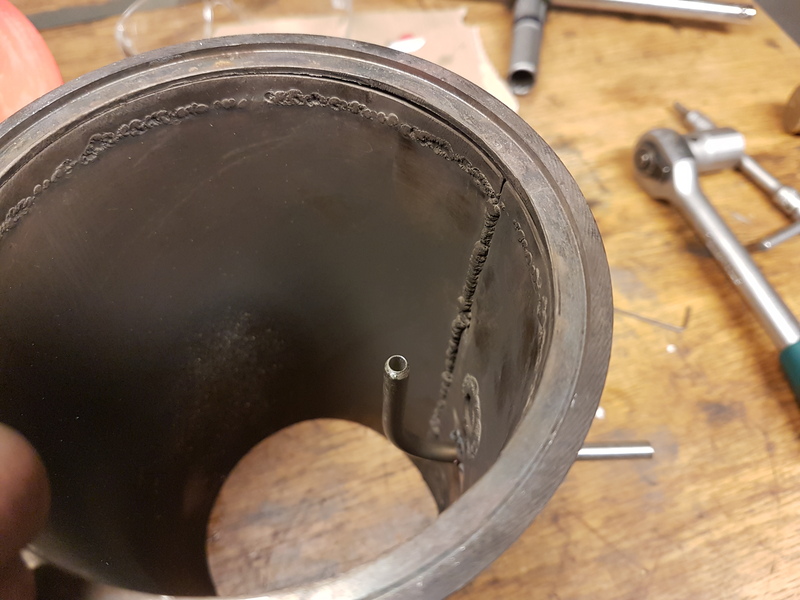 I did a quick birthday run just now to see if the removal of the tank foam has cured the oil pressure problem, but unfortunately it didn´t since the pressure started to drop toward 4 bar as you can see. I backed off the throttle and stopped the engine at that point. I think I am onto something though. After the run I did some thinking when the oil pressure still was low, and noticed that the regulator bleed line was still flowing oil. I tightened down the regulator screw as far as possible but there was still a considerable flow through the bleed line back to the tank. The darn spring must be too weak! 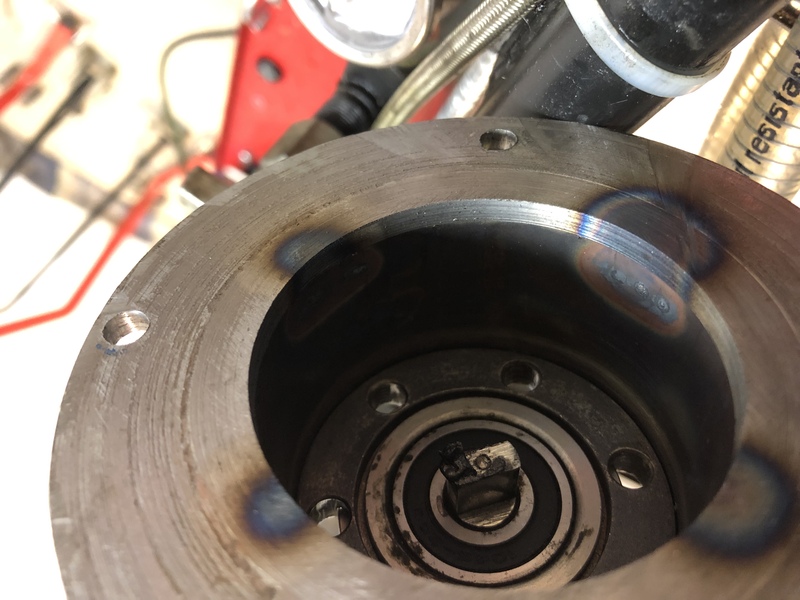 I searched through my shelves and found a stronger spring that fitted the regulator after a little work on the belt sander, with the new spring installed the bleed flow stopped and the oil pressure rose to 5.5bar which can be considered the maximum pressure with that oil temp. An annoyance at the moment is the preheat, it tends to flame out when I start to spin the rotor up and that empties the small air tanks pretty fast. I will figure something out the next time I disassemble the engine. Tonight I rearranged the preheat system a bit, it has bothered me that the preheat tends to flame out when I start spinning up the rotor and the crappy placement of the propane feed is to blame. 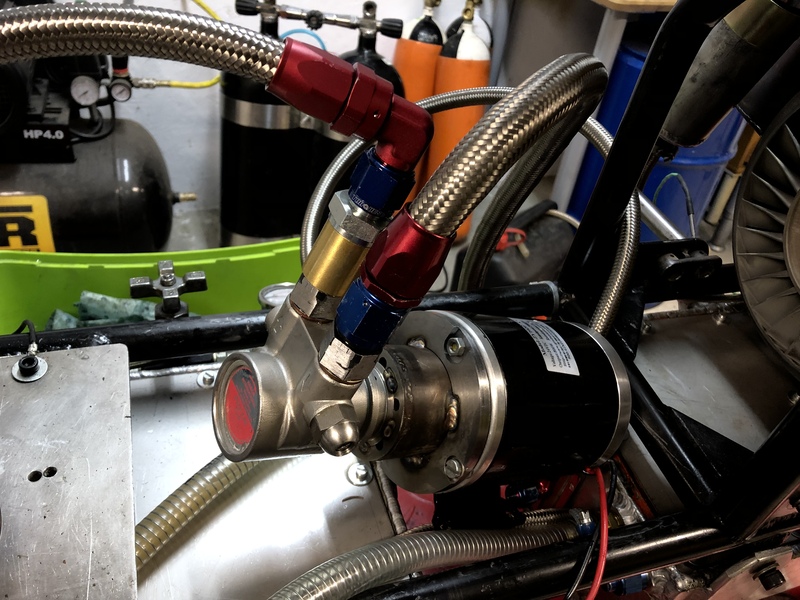 So, to solve this without having to add an internal propane manifold I came up with an idea to replace one of the 18 fuel injectors with a propane dito, this will feed propane into the evaporator tube which puts the preheat flame right where I want it in the primary zone. The old propane injector was replaced with a spark plug long enough to reach the combustor. 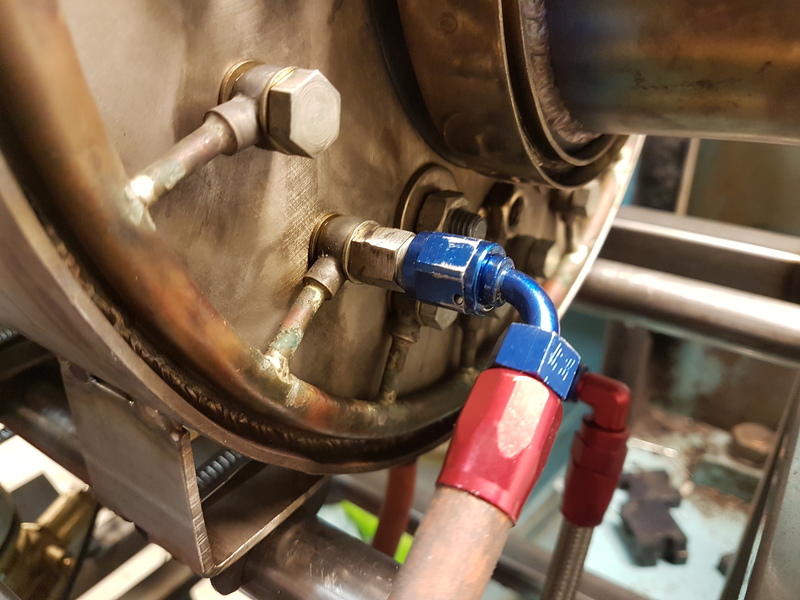 This proved to be a very good arrangement where the propane lights off almost instantly and the flame is kept high up in the combustor instead of burning down past the turbine like before. I also added a 3D printed knob to the oil regulator setting screw so I can more easily adjust it by hand. 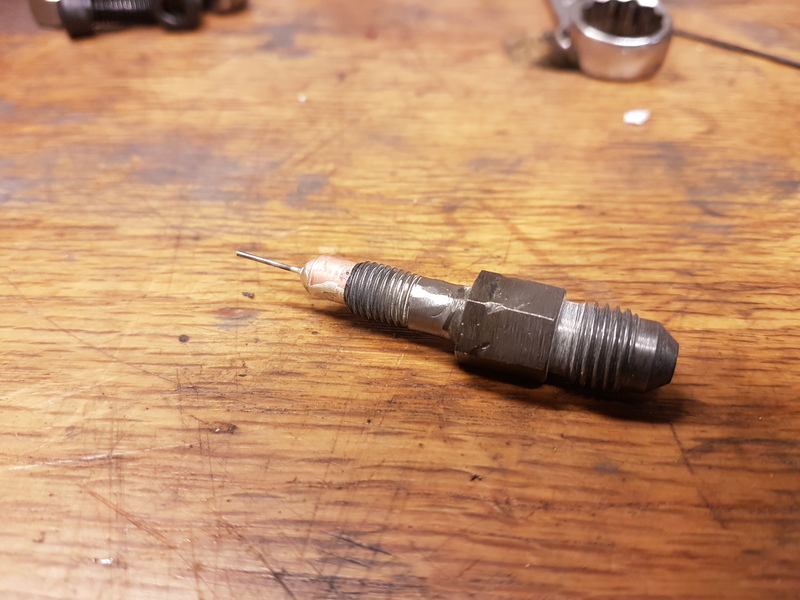 Before I called it a night I made a new jetpipe pressure pitot tube, this one sits closer to the turbine wheel which should give me a more accurate reading. I just need to get a 6mm hydraulic fitting to couple it to the pressure gauge. 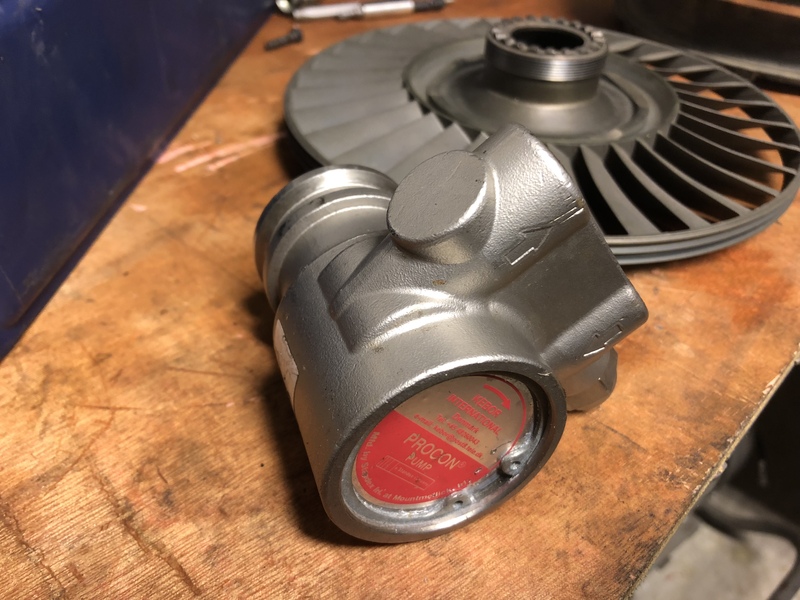 The oil pressure is still giving me grief so I have decided to build a better pump since that is the only thing left untouched during the oil pressure R&D, I have a Procon vane pump that I will couple to a 250w 12v motor that I have ordered. That is almost twice the power of the oil pump I use now so it should be more than powerful enough to give me a solid oil pressure. 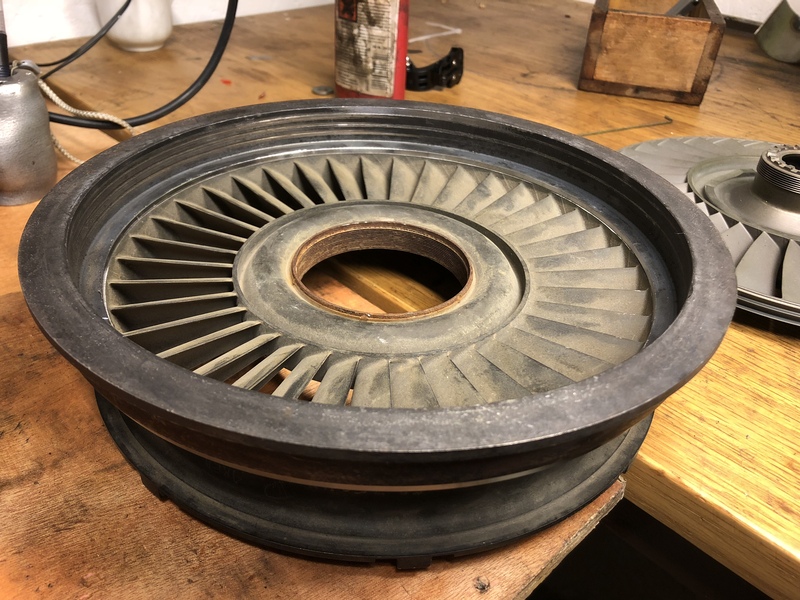 While waiting for the pump motor to arrive I have started building a new guide vane stage for the power turbine, the old one was home built but now I am using an original Rolls Royce C20 NGV stage for better efficiencies and power. I checked the filter delivery estimation and it was some time in January, no way I can wait that long to find out if the pump works! First I hooked the pump up with the home made regulator attached and it worked just fine, then I removed the regulator since the pump has an internal overflow valve that is adjustable and it worked just as fine without it. With the internal regulator set at its loosest the cold oil pressure was 5 bar, and I could tighten it until the pressure gauge bottomed out at over 7 bar so this pump is much more capable than the Marco pump. Much quieter as well, I can barely hear it with the scavenge pump running. 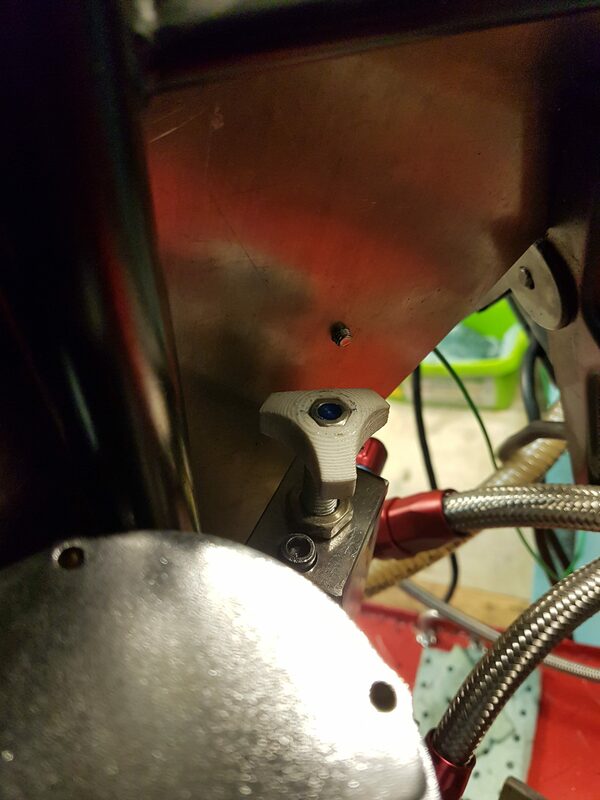 Here is a pair of pics of the pump coupling, it is a left hand M6 threaded piece with a 5mm wide slot milled in it and a stainless sleeve around to keep it tight against the pump shaft. The gooey stuff is graphite lube. New test run done two days ago, I have really started to get the hang of the starting procedure now. You can see the trees swaying at only 50% throttle so this engine is flowing lots of air! 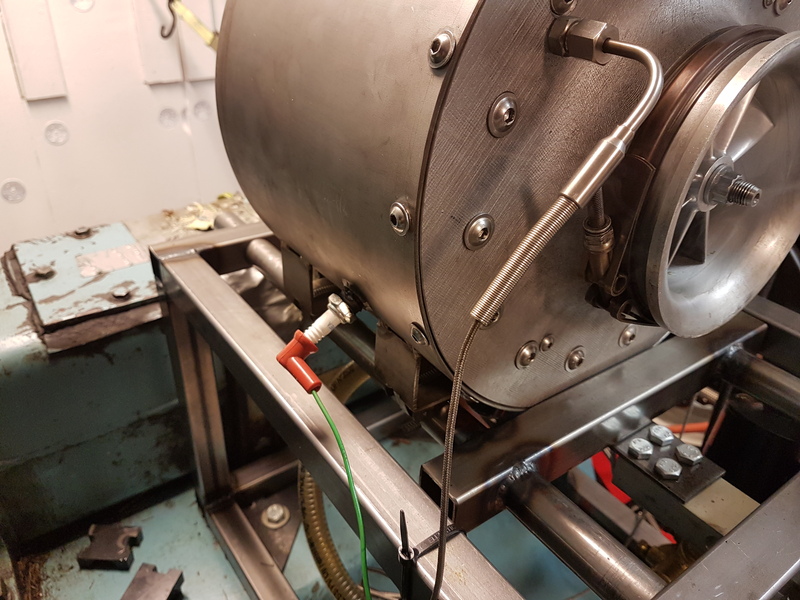 I did a flow test of the pump yesterday, I need 10L/min at 6 bar oil pressure and with warm oil but the pump was only producing 5L/min on 12V. Since the motor is built for 24V I hooked up another battery and got 9.3L/min which is right in the ball park! After some Ebay-fu I found a 960w 40A step up converter that runs on 12v and puts out 24v on the other end, a second battery would be too space consuming and a beefier pump motor would be both expensive and bulky so I put my hopes in the converter. I disassembled the engine after the smoke had cleared and found that the compressor nut had come lose. I had angle torqued it to 130° and used Loctite, so it should have been ok. The manual says 130-145° so I might have to tighten it down a bit more from now on. 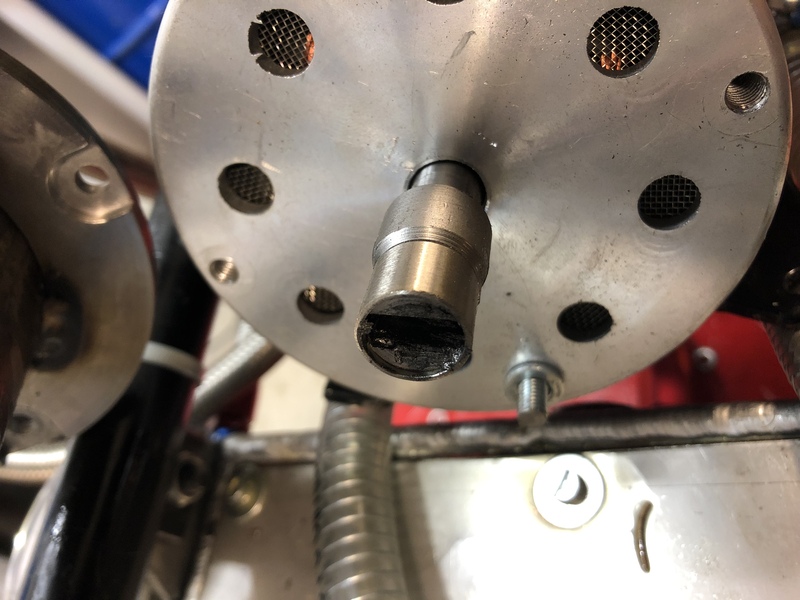 Some of the damage seen is from the oil filter spanner I had to use to remove it from the turbine shaft, the compressor wheel had fused itself pretty good to the shaft so I had to use both the hydraulic press and a propane torch to remove it. 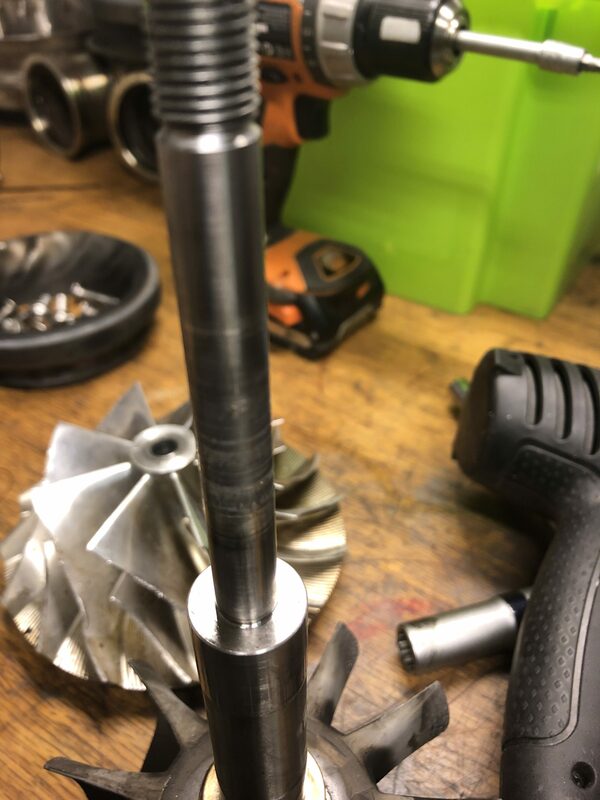 Since the shaft looked a bit worse for wear where the comp sits I will fit the spare turbine shaft and keep this one as an emergency spare. 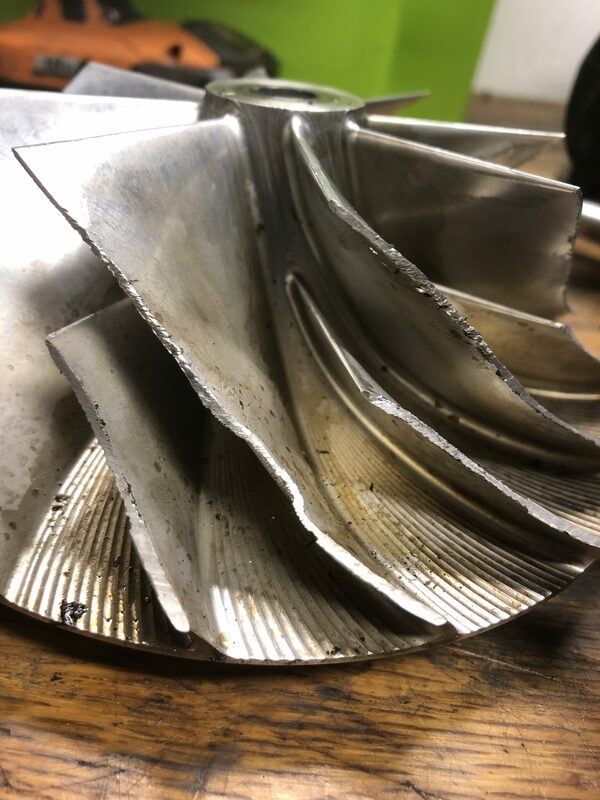 I haven´t disassembled the shaft housing and checked the bearings but they feel tight and the rotor turned freely so I think they are ok. I´ll get me a spare bearing kit and a new KTS X846 compressor and then I should be good to go again. Awesome news that 24V to the oil pump has cured the pressure issue!